The economy has been attacked by inflation that has been eating away at cash in hand and fixed investments. Inflation definitely impacts corporate results. Cost of input like raw materials and services rises, and corporates need to raise prices to protect margins. Inflation tests corporate pricing power, and on an overall basis depresses earnings. RBI tries to fight inflation, by raising interest rates, which slows economic growth. 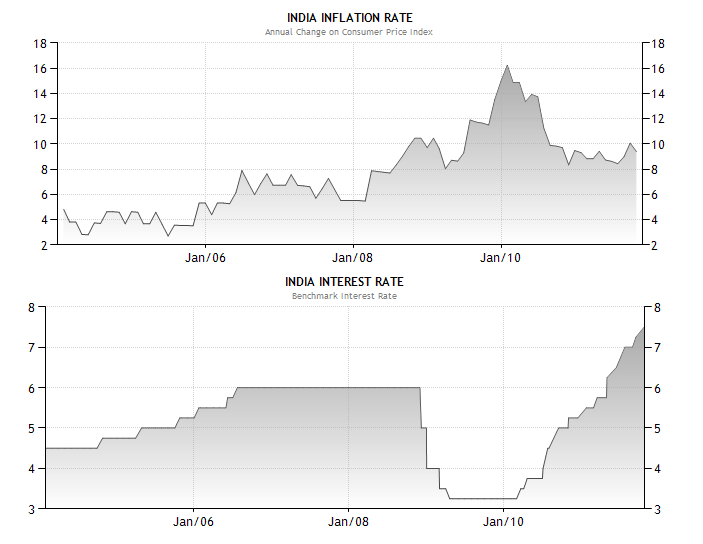 As we can see, the interest rates have been raised sharply by RBI. I believe from here on, the inflation rates will start to fall. And RBI will arrest the rise, and even start to drop interest rates. This situation is good for Interest rate sensitives in our economy, such as Banks, NBFCs, Automotives and Real Estate. These businesses prosper as interest rates fall. Infrastructure sector is also debt intensive, and may stabilize (it has fallen sharply in the last year) on lower Interest rates. Yes Bank (see link to report). Mundra Port and SEZ (see link to report). Muthoot Finance (see link to report). Same as above. The persistent inflation, trade deficit and increasing fiscal deficit are taking their toll on the INR. The rupee has weakened against the USD, and currently is in the 52-53 range. India has a trade deficit, and the situation is worsened when inward flow of FDI/FII capital stops. In response, we have to recalibrate our sectoral expectations. Petrol and imported goods will get expensive. Exports in unhedged USD denominations will get more lucrative. The gainers will be exporters, like IT services, Gems & Jewellery, Auto exporters, Engineering exporters and Petroleum. The losers will be importers, as well as firms with large USD (or foreign currency) denominated debt. eClerx Services (see link to report). A good buy at these levels. The power sector extends across generation, transmission, distribution, power focused lenders and EPC firms focusing on these sub sectors. The power sector is a key driver of GDP, as most firms depend on the Utilities for supply. There is an overall 9-15% shortage of power generated, and demand is growing at 5-6% per annum. The State Electricity Boards face a complex situation of supply shortfall, political pressure to provide free power to Agriculture, Transmission and Distribution losses and thefts. In addition, the power price has to be approved by State level Tariff Boards. The current situation is that many of the Indian SEBs are in crisis due to losses and Cash Flow problems. They are unable to pay for the fuel, or pay the EPC contractors of new plants. Until the Central and State governments free up the market, and restructure loans and help clean up this mess, investments in this critical sector will dry up and suppliers / EPC players will face financial pressures. The only sub-sector in Power that may remain in good shape would be the Upstream resource rich companies. These firms either produce raw fuels domestically or import this. The sheer demand growth will ensure that this subsector will be protected and be a defensive play within Power. BGR Energy (see link to report). Coal India (see link to report). As a long term investor, it does not make sense to react to short term events. But if a theme is to pan out over 1-2 years, it makes sense to adjust the portfolio weightages accordingly. In depressed times, I recommend that retail investors should choose a safe, large cap portfolio and invest in a SIP fashion. See link to report. Gold also is both a good protector of wealth as well as a hedge against global financial uncertainties. See link to report. These reports and documents have been prepared by JainMatrix Investments Ltd. They are not to be copied, reused or made available to others without prior permission of JainMatrix Investments. Any questions should be directed to the director of JainMatrix Investments at punit.jain@jainmatrix.com.